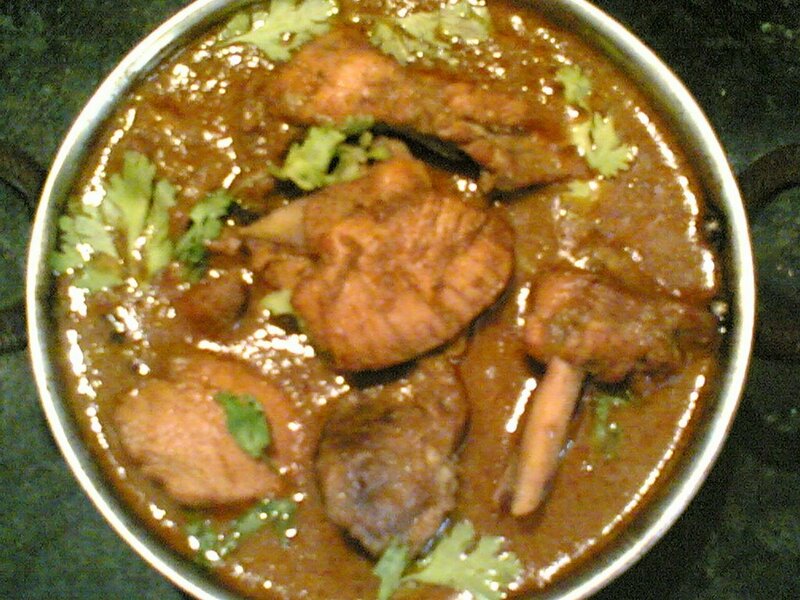 Traditional chicken curry cooked in most Andhra homes is very simple. Button onions (sambar onions or shallots) are generally used in cooking non-vegetarian dishes which are better tasting than the normal onions and have a mild sweet flavor. You can use the normal onions too. This chicken recipe is a basic chicken curry. Simple, easy and tasty! Grind the button onions coarsely. Remove and keep aside. Dry roast dry red chillis, coriander seeds, cumin, elachi, dalchini, cloves, saunf and make a paste adding some water. Heat 3 tbsps of oil in a skillet and add whole spices. Now add the coarsely ground onions and fry till brown. Approx 7 mts. Add ginger garlic paste and chicken and fry for 7 minutes. Now add the ground paste and salt and mix well. Cover and cook till oil separates. Now add 2 cups of water and cook till done. By Sailu Published: December 11, 2005 Kodi Kura, traditional chicken curry cooked in most Andhra homes is very simple. Button onions (sambar onions or shallots) are generally used in cooking non-vegetarian dishes which are better tasting than the normal onions and have a mild sweet flavor. will definitely try this out. wow! i have so many things to try out now. Your chicken curry looks yum. Visiting your blog for the first time. I dont know how I missed your blog. I linked your blog to mine. tried your chicken curry recipe.Came out quite good but not like the photo posted.It was red in colour also slightly watery.Can the masala be ground with coconut.I used 6 kashmiri chillies.U think that was too much.Should i use less. I guess you added more water than necessary.Let the chicken cook till you get the desired curry consistency.Reduce the water content a bit if necessary. I guess the variety of chillis you used must have given the curry its red color. You can add coconut if you want,though I havent usesd it for the above curry. If the spice level is fine with 6 chillis then its ok,I guess. Hi, I love your recipes they have a very authentic home made flavour to it. They also seem to be makable at wish as they contain easily available ingredients, not exotic ones. hi shailu thanks for ur recipy. i dont know how i missed your site. my husband likes to taste andhra dishes. i am happy that i have found one good blog where i can keep in touch with good recipes. thanks for the recipe. I just made this curry and the aroma that it is emanating is awesome.I am very new to cooking and didnt even know a lot of ingredients when I first started cooking.With time,I picked up a lot from your website.Last weekend,for a pot luck lunch for 25 people,I made the spicy chicken masala curry..and it was a hit!! This is good, taste is like a staff curry from a decent restaurant, very authentic taste, thanks, I’ll post some recipe’s soon you’ll love. regards Jamie. i just made this curry..its awesome.. Recently i visited your site, its awesome. You know, how you are helping us out. I have to say you are our ANNAPURNA, because of your receipes. Here in Qatar I am cooking myself. I am an Software Professional, before coming to Qatar, I didn’t know a single recipe, only TEA i am the master in it. But remaining things, absolutely don’t know. But now, with your guidance and preparation of recipes from your sites, now I can able to cook with good taste and almost from the last one month i am following your site and now i am proficient in 20 dishes with ease. Thanks a lot andi… Andhra food is the best in the world. I made this Kodi Kura for my family, and each one of them loved it! Couldn’t take credit without thanking you – Thanks! the measurement of cinnamon in this recipe, is it 2 cinnamon sticks or 2inches of cinnamon?? Which dry red chili should i use, kashmir, madras or bedki chili. I often get confused when it is mentioned dry red chili. Pls clarify. Thanks. You can use Madras red chilies. If you do not have access to Madras variety, use Bedki.